Ask a citizen of Bradford what they make of their city, and they’ll probably say it is not what it was. And also, that it is not what it could be. Certainly it has an illustrious past, and has since been through some tough times and has found it difficult to bounce back. Fortunately, however, a lot of the ingredients are there to make it a special place again. Groups visiting now will still find many fascinating places of interest –and will witness developments in progress that will hopefully bring more of the city’s forgotten treasures and neglected areas back to life, along with some new activities to build its future. There is undoubtedly enough to make a good one or two-day visit here – particularly if the city is combined with one of the nearby complementary attractions, notably the wonderful industrial world heritage town of Saltaire, featured separately at the end of this article. available at the Alhambra Theatre, the bottom of Morley Street and at the National Media Museum, all in the central area. The main train station is also located close to the centre. There are a lot of trails that groups could take around the city, but choice of theme may relate to a particular interest and length of visit. A variety of different tours are offered by specialist guides and themed walks include Victorian Bradford, Essence of Asia, City of Film, Bradford’s Architecture and a Faith Trail. 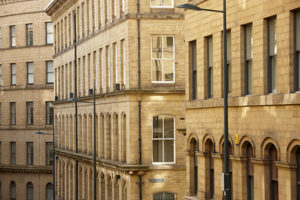 Bradford, as with many other northern cities, grew very rapidly during the industrial revolution, and according to some estimates was the wealthiest city in Europe by 1910. The textile industry, and in particular the wool trade, created enormous wealth, and many believed that Bradford was destined to take its place alongside the great cities, such as Chicago or Hamburg. This, of course, did not happen, but a sense of this vision can still be seen in some of the city’s wonderful Victorian and Edwardian buildings and grand stone-built warehouses. Bradford gradually lost its position as the ‘wool capital of the world’ during the 20th century and the mills progressively closed, though some continued until quite recently. All have now gone, and there is a somewhat surprising low key acknowledgement of this element of its famous past. As the old activities declined, it is now accepted that some poor planning decisions were made, and buildings lost in misplaced efforts to ‘modernise’. In contrast one or two new developments did bring some interesting additions, including the city’s post-war Ice Skating Rink, which is housed in a 1960s tower block, but little noticed, and the Central Library opened in 1967. Another recent addition is the modern extension to the Telegraph & Argus offices at the end of Bank Street. The glazed facade provides an unusual view of the printing press, which is still in operation, and complements, rather than detracts from, the connecting buildings. In many ways, the city is still coming to terms with its decline and some might say that it has yet to find a new role in the modern world. However, it does posses significant assets, such as the remaining impressive Victorian buildings, a young population and diverse multiethnic citizenship. This could, in fact, be seen as an exciting time for Bradford and visitors can experience a city with a proud heritage and interesting recent additions, from the UK’s largest Asian department store to a curry mile. A good place to start a visit and to learn more is the Tourist Information Centre, which houses a small exhibition about the history of Bradford and its people. 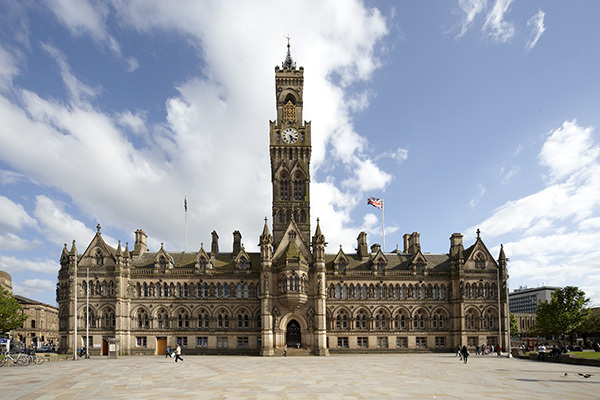 The centre is located within Bradford’s grand City Hall, a magnificent building that points towards the city’s former wealth and self-confidence. Opened in 1873, it features a splendid clock tower, inspired by the Palazzo Vecchio in Florence. The Grade I listed building, designed by local architects Lockwood and Mawson, is gothic in style and is adorned with thirtyfive statues of rulers of England from the Norman Conquest up to Queen Victoria, and even includes Oliver Cromwell. Tours of the building are available for groups and it’s well worth arranging one to see inside this fine building. Upon leaving City Hall, groups should look out for a touching memorial to the 56 who lost their lives following the fire at Bradford City football ground on 11th May 1985. The small sculpture by Joachim Reisner, from Bradford’s twinned town of Hamm in Germany, depicts three figures in bronze and is covered in the names of those who lost their lives. Another impressive sculpture can be found in front of the National Media Museum, where a statue of Bradford’s famous son, the author and playwright J.B. Priestly, is depicted with his coat tails flapping in the breeze. Bradford’s central area is unusally a vast open space, once the home to railway termini and industrial activity. Around the space, now being remodelled as a new square, are several interesting attractions. The National Media Museum overlooks the square and was opened in 1983. Formerly known as the National Museum of Photography Film and Television, it investigates and celebrates film, photography, television, animation and new media and is home to over 3.5 million items. Whilst seeking to display and explore the latest media activity, the museum houses a unique collection of television technology and cinematography and looks after the National Photography, National Cinematography, National Television and National New Media Collections. It has a unique gallery of Kodak photographic equipment and advertising items. The museum obviously owns far more than can be put on display, but further items can be found in the Insight Collection and Research Centre, which can be viewed on a fascinating curator-led group tour. These can be organised to focus on particular themes, such as the history of television, soaps, advertising and early photography. The UK’s first IMAX theatre is part of the museum and continues to offer an exciting programme of 3D and blockbuster films in its impressive vast screened theatre. Groups can view the workings of the projection unit on the top floor. As the museum is also home to the BBC in Bradford, visitors can even watch presenters and researchers collating news stories and broadcasting online and on-air in a working exhibit on the third floor. Its two gallery spaces tend to house photographic exhibitions that draw on the museum’s holdings, and are often combined with new works from contemporary practitioners or loans from other institutions. The museum has a café and parties of 10 or more can enjoy exclusive rates on meals and discounts on IMAX cinema tickets. Entry to the museum is free of charge and assistance is available to help plan an itinerary. With its film links, the city has recently been designated as a UNESCO City of Film and aims to use this to encourage more filmmakers and enthusiasts to come to Bradford. Visitors will, however, notice that the magnificent structure of the old Art Deco Odeon Cinema, located close to the museum, lies sadly in decay and there are no immediate plans for its redevelopment. Also fronting the city’s central open space is the recently built Impressions Gallery. As one of the UK’s leading independent venues for photography, it shows the work of today’s best photographers and has a frequently changing exhibition and a specialist bookshop. In the same building, groups will find the BD1 Gallery, which aims to provide opportunities for people to engage with quality contemporary art and showcases the fine art collection held by Bradford Council. Both galleries offer free admission and run a diverse education and events programme. The open area in the city centre is itself set for transformation. The £24.4 million Bradford City Park scheme, now under construction, will create a six-acre urban park and has the potential for much improving the city centre, providing pedestrian links, event space, play areas and renewed significance to surrounding buildings. Bradford has much open space at present as the result of decay and demolition, leaving derelict sites at the edge of the city. A major 1960s development was demolished recently for a proposed Westfield shopping centre, but remains undeveloped and creates a strange void. Currently there are no firm plans to take the project forward.One effect of the open site is to make more visible the fascinating area known as ‘Little Germany’ on the edge of the city centre. This is a wonderful compact and relatively untouched commercial area and has some of the finest collections of Victorian warehouses in the country. It was constructed between 1855 and 1875 by German and Eastern European merchants and was once the hub of Bradford’s wool trade. There are some fabulous buildings here, and it is well worth spending some time wandering the streets or trying to arrange a visit to one of the buildings and seeing the process of re-use as apartments and creative businesses. The wool theme can be further explored a short walk away at the former Wool Exchange, located on the corner of Hustlergate and Market Street. This fantastic Gothic Revival building symbolises the immense wealth and importance that Bradford had gained from the wool trade in the 19th century. Built between 1864 and 1867 and again designed by local architects Lockwood and Mawson, the building has a wonderfully ornate ceiling and carved wooden arches. Much of the building is now a Waterstone’s bookstore with café and inside groups will find a fantastic interior and a sculpture of 19th century statesman Richard Cobden. Further new uses of old buildings can be found on Morley Street, where the former Windsor Baths has been transformed into a Wetherspoons pub. It’s well worth a look inside the building, now known as the Sir Titus Salt, to see the original structure and iron beams of the Victorian baths. Another of Bradford’s prominent civic buildings designed by Lockwood & Mawson can be found on Bridge Street. St George’s Hall is a somewhat austere looking example of a Victorian concert hall and is lined by classical pillars made of sandstone. The building was opened in 1853 by Queen Victoria and, a year later, Charles Dickens appeared here and gave his first ever reading of Bleak House. The hall nowhosts a range of concerts, comedy shows and productions in its 1,500 auditorium. 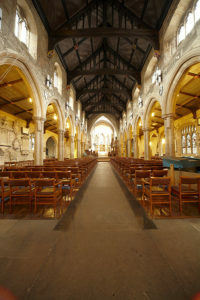 Also well worth a visit is the Cathedral on Stott Hill, Bradford’s oldest building. The current structure was built in the 1400s and is the third church on the site. Groups will enjoy a tour of the Cathedral, which are led by one of the very helpful guides, to explore its fascinating history. Inside its walls, visitors will find John Flaxman sculptures, memorial tablets for prominent Bradfordians and wonderful stained glass windows, including some by William Morris and a magnificent piece that commemorates the Bradford Pals of the First World War. Fittingly for a city that became known for its wool industry, Bradford’s Cathedral was protected during the Civil War from cannonball fire by wool-filled sacks lining its tower, and an engraving marking this event is on display on the North Wall. Tours should be booked in advance and coaches can be parked outside the Cathedral by arrangement. from Asia.Some of these changes and additions to the city’s culture have added new things to see for the visitor, including a number of impressive mosques and temples, the fabulous Bombay Stores, and an array of restaurants. 2010 was crowned England’s Curry Capital. Award-winning restaurants can be found throughout the city and many, such as the Akbars Restaurants, Mumtaz, Nawaab, Omar Kahns and the Zouk Tea Bar and Grill, are suitable for groups. Bombay Stores, located on Shearbridge Road, is the UK’s largest Asian department store and regularly draws shoppers from across the country. Established in 1967, the store is an Aladdin’s cave of treasures, with lavish fabrics, wedding outfits, furnishings, shoes and much more to explore. 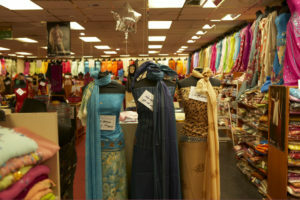 Groups should make a point of visiting the haberdashery, where Bollywood music, cosmetics and silks can be found. Unlike most cities, some of Bradford’s major museums lie a little outside the centre. A couple of miles from the heart of the city, groups will find the fascinating Bradford Industrial Museum in Eccleshill.The permanent displays of textile machinery, steam power, engineering and motor vehicles are housed in the former Moorside Mills, which was built around 1875. Groups can also visit the team of working horses, where they can take a ride in a horse-drawn cart, explore back-to-back cottages that reflect three different time periods, and enjoy the splendour of Moorside House, where the Mill Manager lived. Admission to the museum is free of charge and light refreshments are available in the museum café. 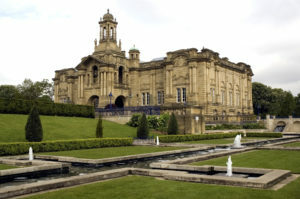 Also located on the outskirts of Bradford, in the magnificent Lister Park, once the estate and home of a wealthy industrialist, is Cartwright Hall, now the city’s civic art gallery. Here you will find an exciting programme of contemporary exhibitions, with four permanent galleries housed in the impressive Baroque-style building. The collection cleverly links the works together and mainly consists of 19th and 20th century British art, including a number of paintings by David Hockney. There is no charge for admission to the gallery and a privately run café is located in the Lister Park boathouse. Undercliffe Cemetery’, can be bought from Bradford Visitor Information Centre.